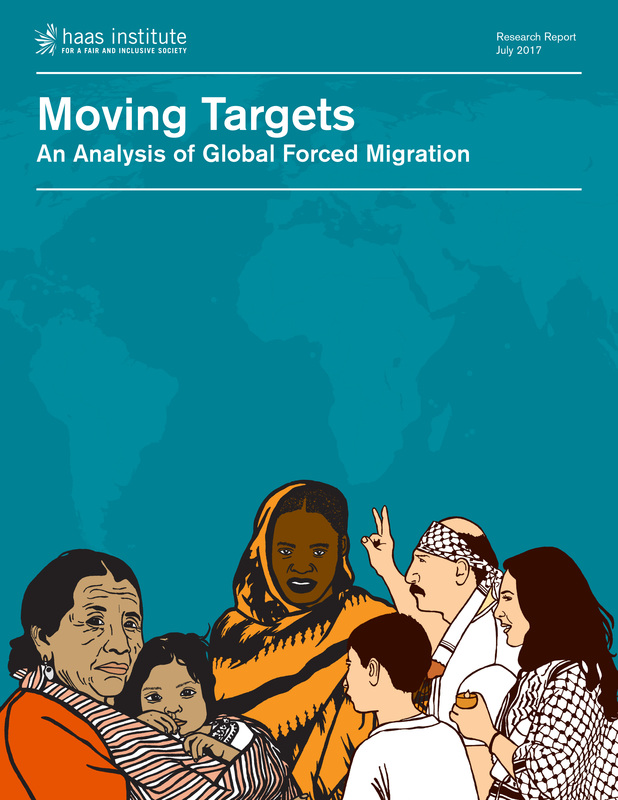 Moving Targets: An Analysis of Global Forced Migration investigates the historical and contemporary causes of forced migration as well as both the challenges and capacities of national and international refugee protections and resettlement efforts. Written by Haas Institute researchers Elsadig Elsheikh and Hossein Ayazi, this report develops a framework of global forced migration that accounts for how experiences of displacement across the globe, and the set of institutional norms and values surrounding “refugeehood,” are inseparable from not only historical and contemporary formations of colonialism, imperialism, and militarization, but also momentary and ongoing environmental changes. It argues that neoliberalization, securitization, and the climate crisis describe these dynamics of global forced migration in the present moment. The report uses as a starting point what is today commonly referred to as the “European refugee crisis." Despite popular notions that frame the US and Europe as the primary regions impacted by the refugee crisis, the authors illustrate how these areas, with the exception of Sweden and Germany, actually host the fewest refugees relative to their population and wealth—yet have the potential to provide greater support to vulnerable displaced persons and refugees from around the world. Aimed at advocates, practitioners, policymakers, and researchers, Moving Targets was written to provide a conceptual framework for understanding forced migration, support improvements in local, national, and international refugee policy, and identify research-based interventions to facilitate fairer refugee support mechanisms. With ten case studies in four “mega-regions” of the world, Moving Targets not only identifies the major dynamics causing massive waves of migration today but also traces the colonial histories of these dynamics and why nations that may seem far removed from the current crises may still have a hand in their creation and exacerbation. Seeking to envision a set of policy interventions that can not only help establish a more comprehensive and equitable global refugee regime, but also help prevent the future production of refugees, Moving Targets serves as an all-encompassing guide to understanding historical and contemporary dynamics of global forced migration and the obligations of actors at various levels.